There was an abundance of laughter, smiles and bow ties present in the upstairs halls at Kelly’s Funeral Home on Woodroffe Avenue in Ottawa on Saturday, the last day of January. Not only was the occasion a celebration of life, it also could have been called Bernie’s tea party. Bernard Turner-Davis, former Executive Director of the Ottawa Valley Golf Association, passed away on Boxing Day, 2014. Bernie is survived by his wife of 64 years Peggy, also his best friend for 73 years and a large family including sons and daughters Timothy Hilary, Sarah and Stephen and their families and children. Bernard was the Executive Director for the Ottawa Valley Golf Association from 1987-2005. Ably assisted by his wife Peggy, the husband and wife team ran the affairs of the OVGA out of their house at Carleton Golf & Yacht Club near Manotick, Ontario. His son Tim read excerpts from Bernard’s memoirs and passed along electronic messages from those not able to be in attendance. Pat Parker reminisced about Bernard’s involvement in activities at the Carleton Golf & Yacht Club. OVGA President Tom Hossfeld talked about his own participation in OVGA events and how he got involved as a volunteer at the urging of Bernard and also offered condolences on behalf of golfers in the Ottawa area. As a former Tournament Director and President of the Ottawa Valley Golf Association, I had the opportunity to work closely with Bernard and Peggy Turner-Davis. They were a team and it is unfair to honour one without acknowledging both. Their attention to detail was a standard at OVGA meetings and tournaments. They were generally the first to arrive at an OVGA event and the last to leave after starting and scoring the event. Bernard had been honoured for his participation in golf in the Ottawa area by Golf Canada, Golf Quebec, the PGA of Ottawa and Flagstick Golf Magazine. After the celebration of life, Tim invited those in attendance to put on a bow tie for a group photograph. I should explain that the bow tie was Bernard’s choice of neck-wear whenever possible. I’m sure that he is proud of the assembled group of family and friends. Golfers in the Ottawa Valley have lost another contributor to the golf community. Rest in Peace Bernard Turner-Davis. 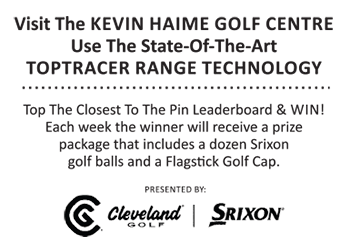 Metcalfe Golf Club – Golf Expo Specials Ready For You!